I've recently been lucky enough to be involved with a new software development project from the very start. One of the advantages of being the first Test Engineer on the project was that I was able to help implement and set up test automation on the project from the very beginning. Frequently software development projects see test automation as an after-thought and try implement it later, when the software is already quite advanced. This results in automation efforts that are always trying to 'catch up' to development which can significantly increase the amount of time consuming manual testing required. I have recently been reading Experiences of Test Automation by Dorothy Graham and Mark Fewster and found this book to be fantastic. It contains many case studies and lets the reader share the experience of how other teams handled test automation. It explains not only what went well but also what went wrong. Ensuring automated testing is included as part of each user story and completed for every release. Ensuring that each automated test runs independently of other automated tests so that when a test fails it can be run alone and the failure observed in isolation. Challenges surrounding running automated tests in the cloud in different browsers. Challenges about what should be an automated unit test and what should be an automated ui test and avoiding duplication of effort between each level of automated testing. Keeping the test suite as "unbrittle" as possible to ensure test failures are worthy of the time spent investigating and debugging the tests. It's fair to say that test automation on any project is a full time job which requires a significant amount of effort to implement and maintain. Automated tests are code and as such they should be subject to the same rules already applied to development code e.g stored on revision, code reviews for pull requests etc. Every Friday morning in our office a company-wide bacon sandwich order is placed. Yes, I know this sounds awesome. It really is awesome. The process for this bacon sandwich order is as follows: An email is sent with a link to a form where orders for bacon sandwiches are collected. The cut off time for placing an order is 9am. The list of sandwich orders are emailed to a local sandwich shop which then start preparing the sandwiches. One person who has placed an order is then chosen at random (using a random number generated at https://www.random.org/) to collect the sandwiches. A second email is sent with the name of the person who is collecting the sandwiches that morning. Everyone takes their sandwich money over to their desk and pays. The sandwich collector then goes and picks up the sandwiches, which usually arrive around 10.00am. When deciding which tests to automate, one criteria commonly used is to identify simple repetitive tasks that are performed often. This morning while completing my bacon sandwich order form I realised that this was a relatively simple task that I repeat each Friday morning. 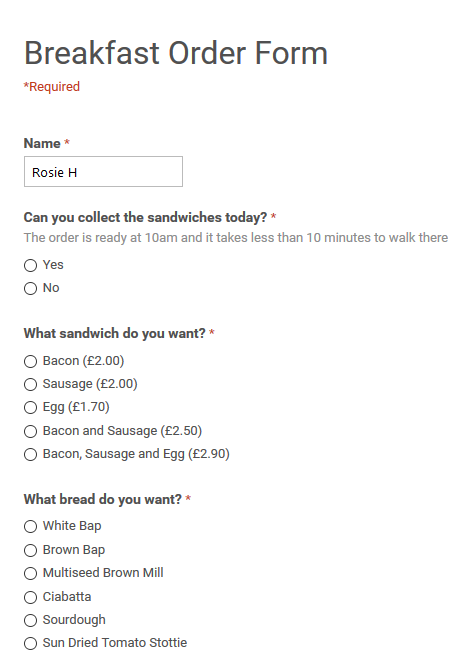 As so much test automation activity had been going on recently on my project, I decided I was going to attempt to automate placing my bacon sandwich order in the simplest way possible. I always order the same sandwich (bacon and egg on ciabatta). I looked back through past emails with the link to the web form and saw that it was rare for the url for ordering the sandwiches to change. Because I wanted to automate this task really quickly, I only had 15 minutes until the cut off time I knew from experience the fastest way to do this would be using Python and Webdriver. 2) Added Python to the PATH environment variable. This was quite easy to do I just went to the Advanced tab of System Properties on my PC. Then I clicked the Environment Variables button, edited "PATH" and typed ;C\Python27 on the end of the string. 5) Opened IDLE (Python's Integrated Development Environment) from my Start menu. 7) Wrote the following basic script. I tested this basic script by typing "python bacon.py" into the Git Bash terminal window. What happened then was a Firefox window opened up and loaded http://www.python.org. Excellent! I now had a very basic browser automation set up and running on my pc. I set about writing the script which was going to order my bacon sandwich. The first thing I did was modify the url in my script to open the url of the bacon sandwich order form. Our actual order form is a public URL so for security reasons (we don't want the internet ordering a billion bacon sandwiches through our order form next Friday) I am going to use http://www.bacon.com as the url in my example to protect the identity of the actual sandwich ordering form. The next thing that the script needed to do was click on the text input box for name and type in my name. This was the name input boxes element tag on the ordering page. The easiest way to locate it was by its id. I saved and ran my script again. It opened Firefox, navigated to the ordering page and typed my name into the input box. The next question on the form was 'Can you collect the sandwiches today?' and underneath this question there were two radio buttons labeled "yes" and "no". As the ids were unique, for simplicity I decided my script was going to click on the ID for "no" as I was busy this morning with meetings at 9:30am and 10:30am which would prevent me from collecting the sandwiches. I ran my script and approximately 2 seconds later, my order was automatically placed. I really liked how quick and simple it was to implement and run a script that performs a simple task. Now every Friday all I have to do is type "python bacon.py" on command line to place my sandwich order. Sometimes it's not necessary to apply layer upon layer of fancy testing frameworks, use complex IDE's and hide code behind abstraction (through page object model etc.) to automate simple tasks. Test automation can be simple and still be effective. It is much better for a project to have a small amount of simple curated automated tests than to have no automated testing at all. Don't forget, it's also a really good idea to start writing automated test code at the same time as the application code.